Today I was invited to speak to Professor Rande Cook’s visual arts class (352 northwest coast contemporary design) at the University of Victoria. He is currently the Audain Professor of Contemporary Art Practice of the Pacific Northwest. My presentation took the students on a journey of my collaborative experiences with Rande and looked at specific pieces we’ve worked on together such as the Collaboration Mask, and art exhibitions such as Ravenous (2014) and Shapeshifting (April 2017). The points addressed during my presentation were that collaboration, critique and conversation are an integral part of art making. Rande has always stressed one of the themes behind our collaborations is that art is alive, influenced and constantly changing. However, by drawing influence it’s also important to have some understanding of what you are seeing and experiencing. Knowledge arises from the awareness of the relationship between different concepts, and the new can alter how we see the past. During the journey between my first collaboration with Rande (Ravenous 2014), and the pieces were are creating for Shapeshifting (Fazakas Gallery April 2017), a better understanding of the design elements and iconography of northwest coast art has occurred for me. 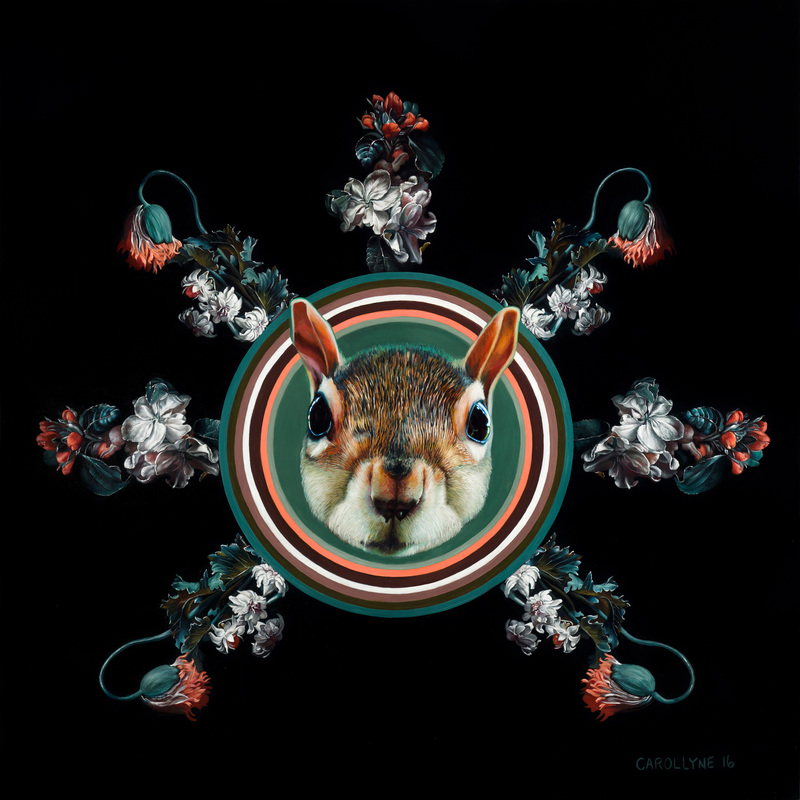 For my oil painting Sun Squirrel (above) I was reminded what Rande told me if I were to be inspired by the work of Robert Davidson for example. I wouldn’t simply want to copy one of his images in a different medium which is more like admiring the work without knowing what you are looking at. Robert is known for a perfectly cut line. And to be inspired by his work would mean to draw a perfect line without error. This got me thinking about how to look deeper into northwest coast art and contemporary design elements. 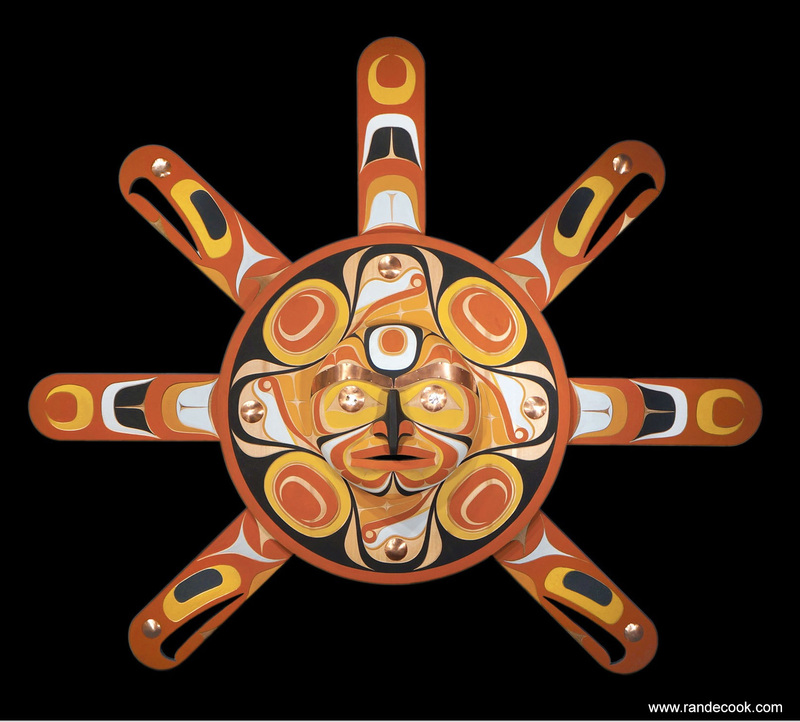 Specifically, the form behind Rande’s Kwakwaka’wakw iconography, the geometry, symmetry and nature of the elements themselves. Looking beyond the ovoid, form line, fine line, and trigon, what was I also experiencing spiritually, vibrationally, or even numerically? The Sun Mask by Rande Cook is a masterful carving created using traditional Kwakwaka’wakw First Nation iconography, and is made of red cedar, acrylic paint, abalone, and copper was the reference of the first painting of our latest project. Rande told me the four faces around the centre face represents the four corners of the world in which light spans, the four seasons (four is a sacred number). The red rings around the faces is the circle of life, the ring of unity. The seven rays are for the days of the week, and the seven kingdoms of heaven. The eyes are abalone providing vision / foresight to see the future, and the betterment of humanity, including knowledge and understanding. Eagles are carved into the rays for their ability to soar high, and nobility. Slowly dissecting the image, I researched information about the sun in Rande’s culture and in other cultures. I also researched the number seven to examine more deeply the meaning behind the seven rays emanating from the circular centre from where a face appears. In a previous project, Rande explained to me how the circle also means different worlds, and I interpret that to mean circle as time, and endless renewal or regeneration. Part of my research took me to exploring the cycles of the number seven in Judaism, Christianity, Hunduism, Buddhism, Islam, and different esoteric belief systems. Many of the texts I discovered discussed the number seven in relation to the existence of soul, and the spiritual essence emanating from every human being, soul evolution, and the human consciousness. There is no tradition that does not mention the number seven in one form or another and its creative power. It is linked to cosmic rhythms and cycles that apply to both the visible world and the invisible world. 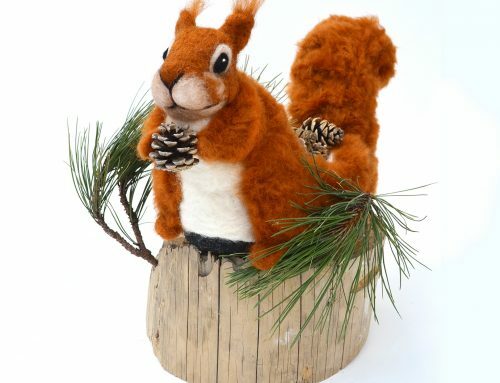 When it came time to put this research into action, my response was to continue work with the centre face as Squirrel, the circle representing different worlds, endless time, regeneration and manifestation, which the squirrel certainly represents itself endlessly through time in space in my personal world. 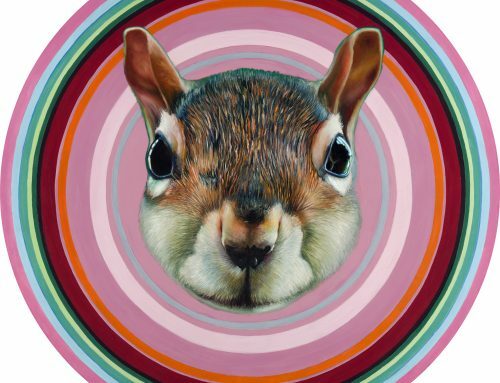 The Alchemist (squirrel) is at the centre of the Sun and represents the pursuit of consciousness and soul evolution. The seven flowers stems represent the illuminated powers of human consciousness. 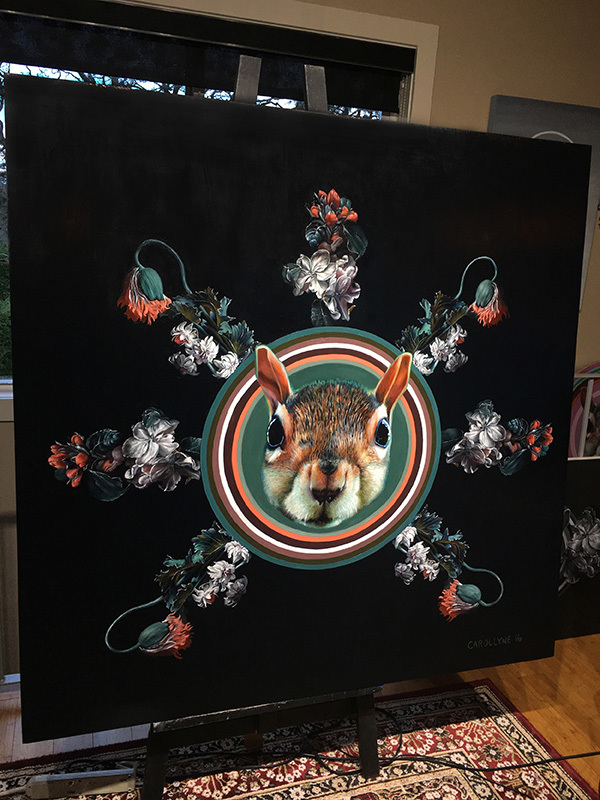 What is most interesting to me is that during the last month I had visitors to my studio who saw my Sun Squirrel painting. 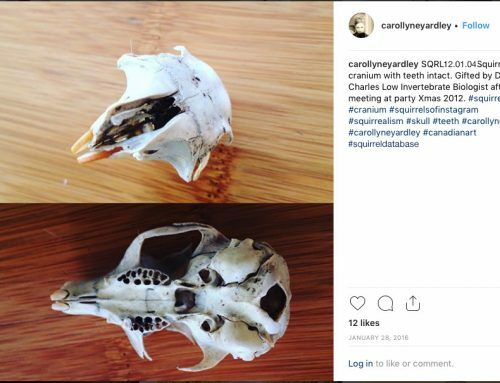 They each remarked how it looked so northwest coast to them, which was exciting to me since there are no obvious ovoids, form line or other iconic elements. 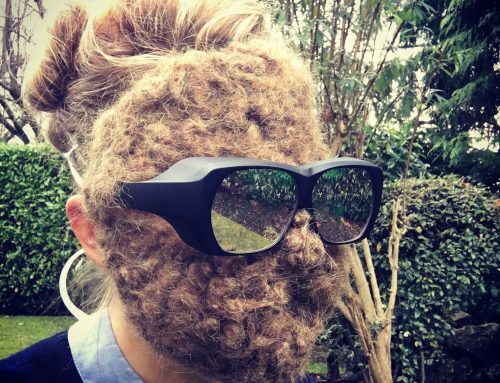 Plus, they didn’t know about my reference of Rande’s Sun Mask. I was asked by a student in Rande’s class today if I would ever use form line in my own work outside of my collaborations with Rande. Because I haven’t been trained in the specifics of northwest coast art and contemporary design and I do not have a deep personal connection to the form, I wouldn’t begin to think of incorporating it into my own work. 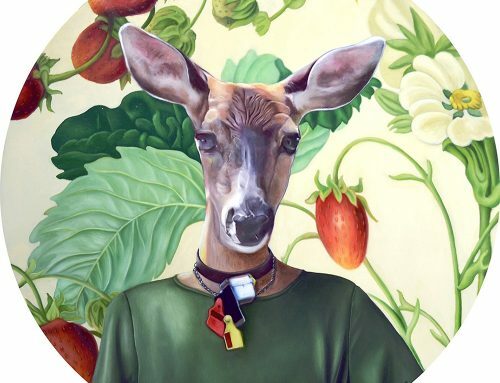 Plus, it’s evident to me that I can be greatly influenced by a piece of art, by Rande’s art, and look beyond its iconic elements to describe what I’m seeing, understanding, thinking, feeling and experiencing using my own visual dialogue. 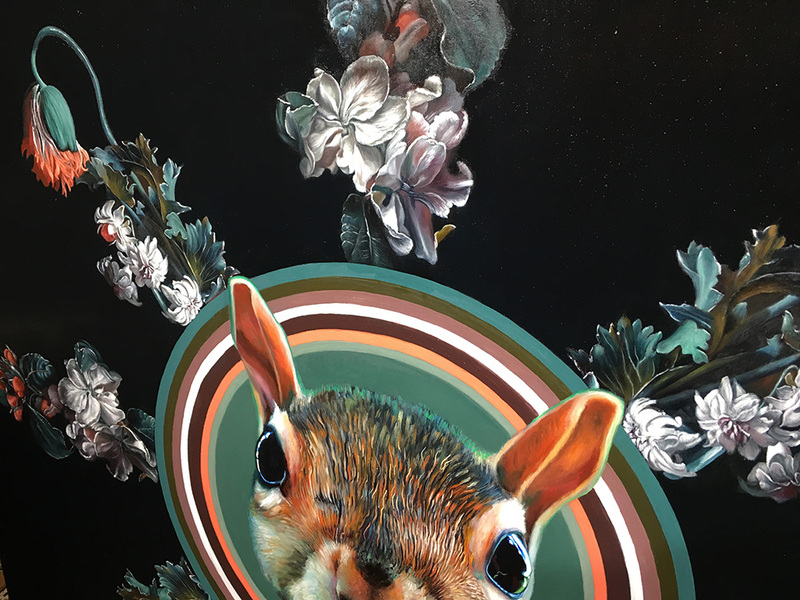 By carollyne| 2017-04-10T16:53:27+00:00	January 26th, 2017|Art News, Art of Consumption, Paintings, Squirrealism, Squirrel Series|Comments Off on Sun Squirrel influenced by Rande Cook Sun Mask. How art is alive, influenced and always changing.